Dr. Kevin Reichmuth is a native of Columbus, NE. 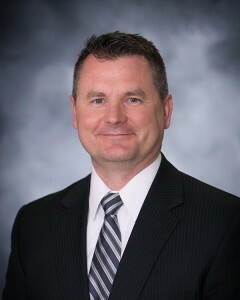 He earned a Bachelors of Science from the University of Nebraska – Kearney and completed his medical degree at the University of Nebraska Medical Center. Dr. Reichmuth completed his residency and fellowship in Internal Medicine, Pulmonary Medicine, Critical Care, and Sleep Medicine at the University of Wisconsin Hospitals and Clinics in Madison, Wisconsin. He is board certified in all four specialties. Dr. Reichmuth was well published in the area of sleep medicine during his time at the University of Wisconsin, conducting research on sleep apnea and diabetes as well as sleep apnea and vascular disease. He is currently the Medical Director of the Columbus Community Hospital Sleep Laboratory and does outreach clinic in Columbus and Wahoo.